Do you have enough faith? Yes! Thomas Merton, the Trappist Monk well known as a spiritual master, wrote that “faith is communion with God’s own light and truth” (New Seeds of Contemplation). Do any of your prayers go unanswered because you don’t have enough faith? No! — because faith is union with God. If you believe in God, and if you believe that he loves you, and if you love God, then you have faith. Praying with faith is the act of communing with him through everything that happens in life, whether you are conscious of it or not: communing with him in quiet contemplation of his goodness, communing with him in doing good, communing with him in your yearnings and in hope and desire and dreaming of better times, communing with him in your trials and difficulties, communing with him in every decision you make, communing with him in your relationships and in figuring out how to handle the relationships and how to grow those relationships. Faith is not something that we conjure up. We cannot work at building up “faith muscles”. Faith is a gift from the Holy Spirit, as it says in Romans 12 and 1 Cor. 12, to help us live a holy life. Faith is something that by God’s grace we receive in our baptism. We receive it because we are God’s children and he wants us to commune with him. He wants us to be in union with him, embraced by his love forever. Faith is our connection to God. Belief is what avails us of that connection. Do you believe in the goodness of God? Do you believe that Christ is your Savior? Then you have made yourself available to the grace that gives you faith. For example, think of the Dead Sea in Israel. It’s called the “Dead Sea” because it’s so full of salt that nothing can live in it. And because it is so full of salt, if you were to go there and get into that water, you would never sink. For those who go on pilgrimage to the Holy Land, it’s often one of the sight-seeing stops, because people want to experience that buoyancy, that inability to sink. If you have never experienced it and someone tells you, “Trust me, you won’t sink,” but you don’t know how to swim, will you truly believe that you can safely go down into the waters of the Dead Sea, out into the depths of it and never sink? Remember, you can’t swim! That’s what faith is. Faith is not the action of going out and testing the waters. It is the reality of of staying afloat. First, we believe that it’s true: “I won’t drown. That water will hold me up, even though I have never experienced anything like it before. I do not need to be afraid.” Then, faith becomes the reality of it. Likewise, communion with God is the reality that you can’t sink spiritually. As long as you truly believe in God’s love and goodness (and this is evidenced by the goodness that it brings out in you), the reality is, whether you can swim or not, you will float safely through all challenges and hardships. God will keep your head above water. Believing in God’s goodness brings out the goodness in us, and thus faith without good works is dead, as it says in scripture. Communion with God is an action: We act the way he wants us to act. We act the way God wants to act through us. 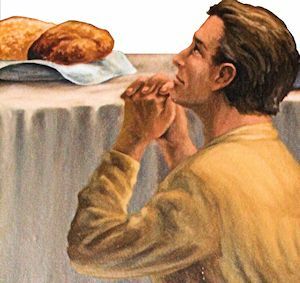 Prayer becomes powerful when we believe that what God says is true; this belief enters us into the faith – the communion with God – that is already ours. When praying for somebody or for your own needs, it’s a misconception to think, “I don’t have enough faith; this prayer is not going to get answered.” You do have enough faith; you have all the faith that the Holy Spirit has given you, which is the same faith that Jesus had in the Bible; the same amount of faith! We can’t build up our faith for our prayers to be answered. Rather, we just have to build up the activities that enter us more fully into union with God – activities such as going to Confession to overcome our sins, growing in holiness, getting to know our Lord better by reading scripture and other spiritual books, going to faith formation classes at church and attending parish missions and whatever else can help us to know God better. This is what we build up. This helps us avail ourselves of the faith that God has already given to us. If our prayer power is weak, it’s not because we don’t have enough faith. It’s because we haven’t realized the fullness of our union with God yet. We haven’t entered into it enough. We haven’t realized it in action or in belief. Once we realize it, we also realize that we are just God’s instruments, we are Christ’s hands and feet. When people say to us, “Pray for me,” God is already caring about their situation, because he loves them. Jesus is already praying for them, but he has to use our hands to lift them up in prayer. He has to use our voice so they can hear themselves being lifted up, which builds up their awareness of their communion with God. By praying with them, for them, they feel cared about, and thus they become more aware that God cares about them. When we realize that we are merely conduits of God’s healing, conduits of God’s grace, conduits of God’s love, conduits of God’s solutions to the problems being faced, then his power flows through us. We don’t need more faith; we have all that we need. We need to become more aware of what to do with that faith and how to enter into it more fully.